Macbeth is one of Shakespeare's most well-known tragedies. You know the story, it's the one about the Scottish general who receives a prophesy that he will be king, so he kills a bunch of people with the help of his wife until they both go crazy. It's a typical Shakespeare tragedy, full of battles and death and insanity. Mission Theatre Company's production is a creative interpretation of this classic, with music, drumming, and very physical performances from the cast. At the center of the show is Michael Kelley as Macbeth, with an intense, mesmerizing, fully committed performance as he takes Macbeth from a happy and optimistic general in love with his wife, to a desperate, grief-stricken, ghost-seeing crazy person. Also good is Amy Vickroy as Lady Macbeth; the two have a real connection onstage. The prophetic "weird sisters" (played by Abby DeSanto, Anneliese Stuht, and Andrea Rose Tonsfeldt) are deliciously weird and creepy, always onstage (even as the house opens before the show), striking statue-like poses, speaking rhythmically in unison ("double double toil and trouble, fire burn and cauldron bubble"). A few gender changes are done very well. Macduff is a woman (well played by Meagan Kedrowski), and (spoiler alert) it's her husband and children who are killed at their home while she's the one to avenge them and kill Macbeth. And King Duncan's daughter, not son, eventually becomes "King of Scotland" when the dust settles. Penelope Parsons-Lord directs this capable cast in their matching hairstyles of braids and fauxhawks, and has also designed the aesthetically pleasing and functional costumes - good for running, rolling around, and fighting but still looking regal or soldier-like. 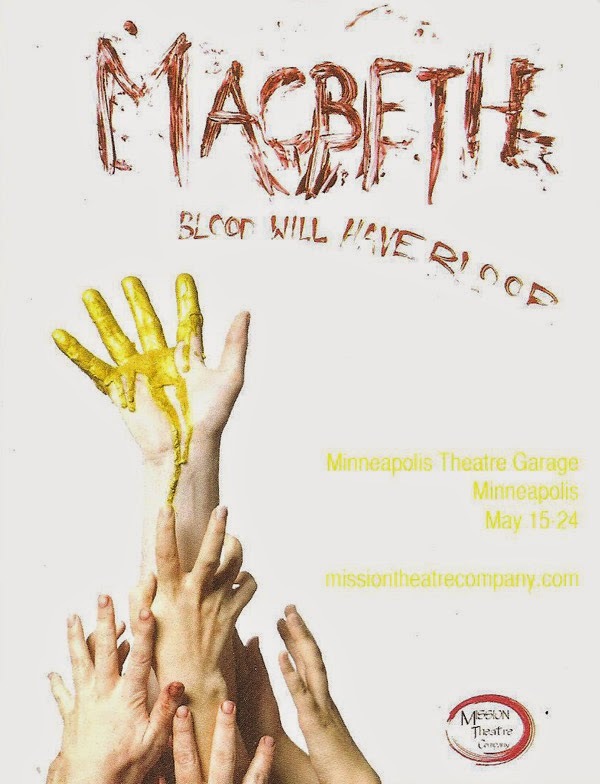 And as if giving a great performance as Macbeth isn't enough, Michael Kelley has also designed the sparse but effective set in the large blank slate of a space that is the Minneapolis Theater Garage, and is responsible for the fight choreography. It's some of the most intense, brutal, realistic, intricately choreographed stage fighting I've seen, with the copious blood elegantly represented by red ribbons. Mission Theater Company's Macbeth is a creative interpretation of a class that remains true to the story. But being Shakespeare, it's still quite long, almost three hours with intermission. I wish they had pared down the story to a more manageable two hours or so (like the Guthrie did several years ago), but maybe that's just my sleep deprivation talking. If you're a fan of the Bard, you might want to check out what they've got going on (playing through May 24). P.S. There's also a really cool art exhibit in the lobby, so check that out if you go.